On Saturday 11th August, 2012, The Noble Shaykh 'Arafat Muhammady (May Allaah Preserve Him), one of the virtuous mashayikh of Madinah, K.S.A., and from the best students of the 'Ulamah (scholars) of Madinah most prominantly Shaykhanna al-Walid 'Ubaydullaah al-Jaabiree (May Allaah preserve him) will deliver a LIVE Tele-Lecture with Muwahhideen Publications narrating to us some examples of the behaviour salaf us saalih (righteous predecessors) in the last ten nights of Ramadhaan. The Shaykh is highly praised for his efforts and firmness in dawah by Shaykh Rabee' ibn Hadi al-Madkhalee (May Allaah preserve him) and many others of the ulamah (scholars). This event will be broadcast LIVE in Masjid Ibn 'Abbaas, Tobago, two masaajid in Trinidad, Masjid ul Khaleefah and Masjid us Sunnah, and four Masaajid in the U.S. Masjid Al-Bukhaari, Florida, Masjid Ibn 'Abbas, Georgia, Masjid Uthaymeen, New Jersey, and Masjid Nur Allaah in New York. Muwahhideen Publications has organized a LIVE Tele-Lecture with the Noble Shaykh Muhammad ibn Rabee' ibn Hadi' al-Madkhalee (May Allaah Preserve Him), son of Ash-Shaykh al-Allaamah Rabee' ibn Hadi al-Madkhalee (May Allaah Preserve Him) and a professor of Aqeedah in The Islaamic University of Madeenah. The Shaykh has written many books, more famous of which is the refutation of the sufis, which is available in English. The Shaykh will elaborate on the virtue and excellence of the last ten nights of Ramadhaan. This event will be broadcast LIVE in three Masaajid across Trinidad & Tobago and five Masaajid in the U.S. In Tobago, Masjid Ibn 'Abbaas, In Trinidad, Masjid ul Khaleefah and Masjid us Sunnah, and in the U.S. Masjid Al-Bukhaari, Florida, Masjid Ibn 'Abbas, Georgia and Masjid Uthaymeen, New Jersey, and Alhamdulillaah our brothers from Masjid As-Sunnah An-Nabawiyyah, Germantown, PA and Masjid ar-Rahmah, New Jersey, have joined on to benefit inshaaAllaah. Muwahhideen Publications in co-ordination with several masaajid across Trinidad & Tobago and the U.S. has organized a LIVE Tele-Lecture with Shaykh Ahmad ibn Mubarak al-Mazroo'i (May Allaah Preserve Him), from the Mashayikh of The United Arab Emirates. The Shaykh is known in the middle east and is a student of and recommended by al-Walid Ash-Shaykh 'Ubayd ibn 'Abdullaah al-Jaabiree and Ash Shaykh and Allamah Muhammad ibn Hadi al-Madkhalee (May Allaah preserve them both). 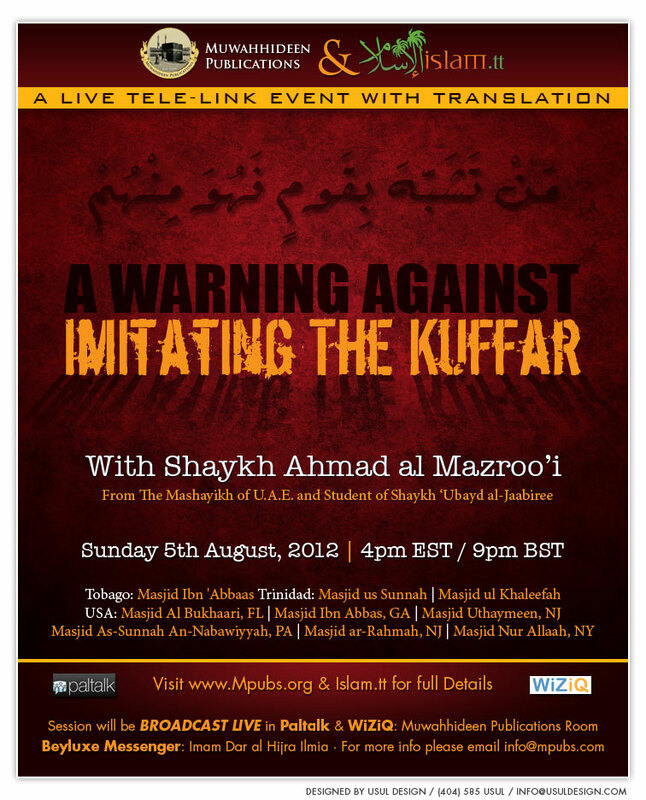 The Shaykh will elaborate on the sickness of imitating the kuffar. This event will be broadcast LIVE in Masjid Ibn 'Abbaas, Tobago, two masaajid in Trinidad, Masjid ul Khaleefah and Masjid us Sunnah, and four Masaajid in the U.S. Masjid Al-Bukhaari, Florida, Masjid Ibn 'Abbas, Georgia and Masjid Uthaymeen, New Jersey, and Masjid Nur Allaah, NY. This lecture event will be translated LIVE into English inshaaAllaah. Muwahhideen Publications has organized a LIVE Tele-Lecture with noble Shaykh 'Abdullaah ibn Sulfeeq adh-Dhufayree, Imaam of Masjid Mu'awiyyah ibn Abi Sufyaan in Hafar al-Batin, K.S.A. The Shaykh is well known to the major scholars of our time, like Shaykh Rabee' ibn Hadi al-Madkhalee and Shaykh 'Ubayd ibn Sulayman al-Jaabiree (May Allaah preserve them both), who both wrote introductions and recommendations to his books. Shaykh 'Abdullaah adh-Dhufayree is also a professor at The Islaamic University in Hafar al-Batin and is very active is dawah throught the Kingdom of Saud Arabia and outside of it. He participates in conferences alongside the major scholars, like Shaykh Rabee', Shaykh 'Ubayd and Shaykh Muhammad ibn Hadi, (May Allaah preserve them all), and these major scholars also attend his masjid to give lessons as well. The noble Shaykh 'Abdullaah will be reminding us of the great reward of Ramadhaan, forgiveness from Allaah. This telelink event will be broadcast in three Masaajid in Trinidad & Tobago and four Masaajid in the U.S. In Trinidad & Tobago: Masjid Ibn 'Abbaas, Tobago, Masjid ul Khaleefah and Masjid us Sunnah, and in the US: Masjid Al-Bukhaari, Florida, Masjid Ibn 'Abbas, Georgia, Masjid Uthaymeen, New Jersey, and Masjid Nur Allaah, New York. This session will be translated LIVE into English inshaaAllaah.